May 12, 2009. Your webmaster has wanted to weigh Marionette,Marscot/O'Day #12, ever since I got her. All these years I have been too cheap to go to a commercial weigh station. Our town has a recycling center and has recently installed a truck scale. A few days ago I asked the town guys if I could weigh my boat on their scale and they said sure. This took place today, after which she was launched. These scales are highly accurate and this one is brand new and just calibrated. It weighed me accurately. Stripped out, Marionette weighs 4236 lbs. 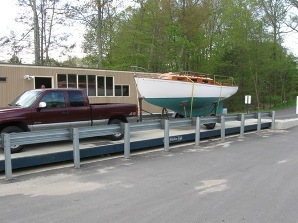 This boat weighing opportunity led to a consideration of weight other than the boat itself. I had to get all this stuff ready anyway so I catalogued Marionette's sailing inventory by weight and it surprised me. Nearly 800 lbs without crew, food, ice, beer, clothes, teddy bears, etc. And I bet I missed some stuff. The designed displacement for the Marscot/O'Day Dolphin was 4544 lbs. December 12, 2106. 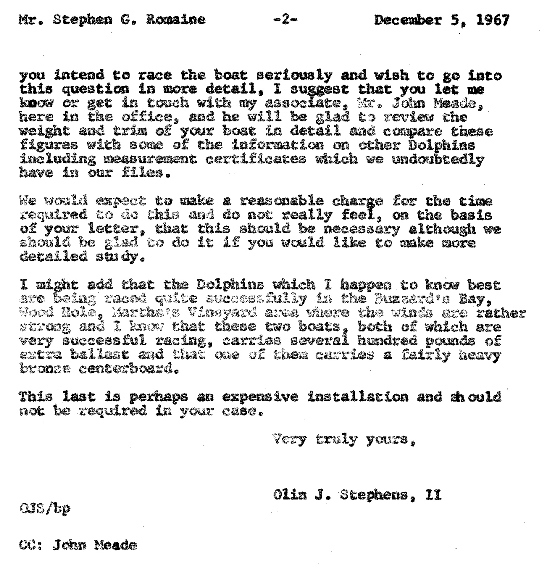 Bruce Johnson, former chief designer at S&S advised that, re the 1960 Dolphin, "Design displacement is generally lightship, no fluids or personal effects". Here is my list. After we go through this tedious but weighty matter, we will try to develop a rough guide for how much additional weight/displacement affects the waterline, and theoretical performance. Your attention is drawn to Olin's comments where he says that the additional lead ballast (430 lbs) would cause something like 1" additional draft. The following is excerpted from an S&S internal memo from John Meade to Rod Stephens. To see the full memo, click here. 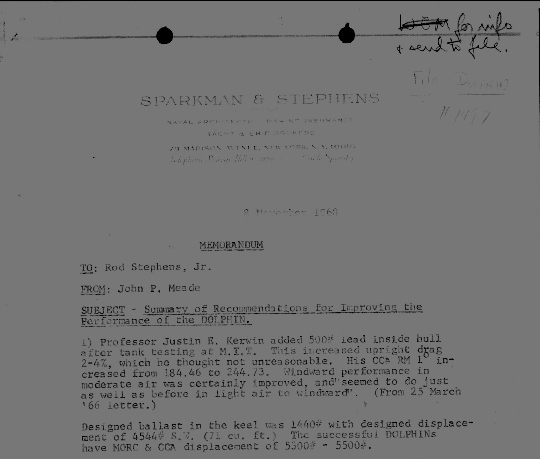 The copy quality is very poor so the excerpted text content is repeated below the scanned copy on the memo. The S&S design displacement of the Marscot/Lunn/O'Day built Dolphins was supposed to be 4544 lbs - we do not know what items are to be on the boat to reach this number - we are working on this. The Yankee and Pacific Dolphins were supposed to be 4250 #. Every Dolphin has its own actual displacement depending on the various weight components of that boat; ie an inboard, type of head and holding tank, water and fuel tank capacities, interior details and options, etc. The following formula - max beam at waterline x length at waterline x a waterplane coefficient x 64.2 (weight of 1 cubic foot of salt water - fresh water 62) divided by 12 = weight in lbs of a 1 inch change. 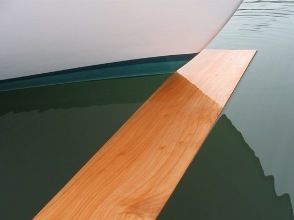 As an example a typical coefficient of say .67 would produce a theoretical 439 lb change on a boat that had a 6' 3" max beam on the waterline and a 19' 6" length. If the max beam at the waterline were 6' 9" the weight increase would be 472 lbs. 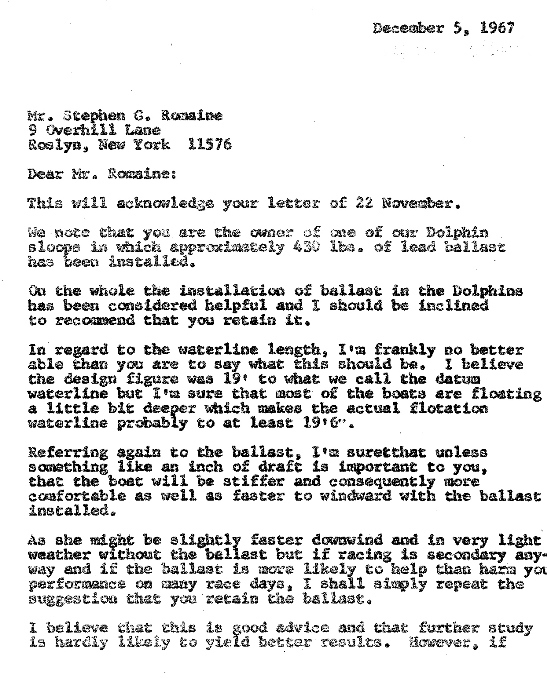 All Dolphin builders advertised the same waterline length 19'0" - the same as the DWL (Datum Waterline Length) that appears in the S&S design drawings. But typically most Dolphins actual waterlines are longer by a few inches. There is an international standard on this stuff, ISO 8666. Of course ISO did not exist in those days so the designers and builders had their own practices. Finding out exactly what they were in 1959/60 will be a challenge. 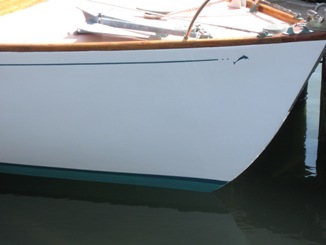 Marionette's and Passage's hulls have 2 scribed lines in the hull - they are 2 inches apart. One would like to think that the lower one is in the same location as S&S's Datum Waterline Length (DWL). It is close but it is not, I don't think. Apparently, builders put these lines in the molds once they are sure that is where the waterline actually is. I paint Marionette's boot stripe ON TOP of the top scribe line on the hull, not beween the 2 scribed lines where she historically had her boot stripe. When loaded but without crew aboard I think she floats about 1/2 to 1 inch below the bottom of the boot stripe. I have convinced myself that when other racers see her floating above her apparent waterline they will think she is light and this will psych them out! In the above photo, Marionette was just launched and has 194 lbs of stuff aboard needed to get her to her slip - motor, 3 gal fuel tank, tool and spare parts boxes, anchor and rode, fenders, dock lines. If the above table of stuff is to be believed, and I step aboard, this will add close to 800 more lbs, and give or take another 2 inches of immersion. I will wait for a super quiet day and try and measure her waterline length and the height of her freeboard at the max beam in this current state, when she is totally stripped, and when she has her rig and is 'fully' loaded, more or less - and then take these same pictures. Stay tuned. Note: Special thanks to Mark Steinhilber (Rascal) who is a marine architect and has provided valuable guidance. May 30, 2009 Finally, we had a good day to take our next set of controlled weight and waterline measurements. Click here to see the detail of those measurements. To the base boat we added the rig and other stuff to approximately simulate what the early Dolphins displaced with the standard Palmer 8hp inboard engine. This is a 'husky' engine with some weighty accessories - solid bronze control levers for the transmission, prop shaft, 10 gallon copper tinned gas tank and presumably a battery, engine controls. plus a 20 gal water tank, and perhaps some other 'standard' items. We added 447 lbs of weight to the stripped boat which added 3' of waterline length and made the boat float 1" deeper in the water. This brought the float line to approximately the bottom line scribed in the hull in the sketch above. Using the measurements obtained, a Dolphin's waterplane coefficient at a freeboard height of 25.75" is .67. Kudos to Mark Steinhilber (Rascal) who called this one spot on. Responding to popular demand, someday, we will repeat these measurements with the additional weight/displacement for a fully race equipped boat, and a fully cruised equipped boat.